In keeping with this week’s theme of Pre-Blog Projects Revisited, here’s one of my favorites. I’m sorry I do not have a “before” picture of this one (I did the bulk of this make-over about 3 years ago). It was just the basic structure when I moved in, being used for bicycle storage. 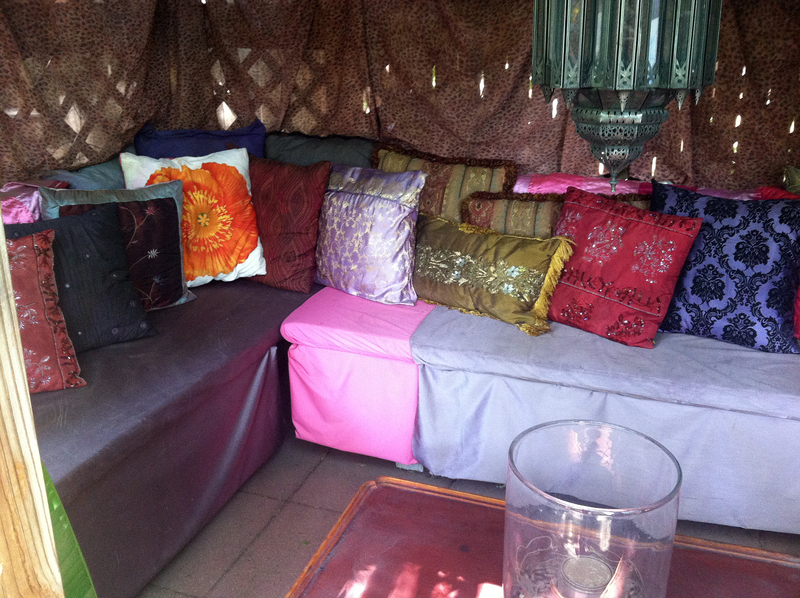 I wanted to turn it into a seating area, but of course, it had to be cheap and easy. Since I don’t have my usual “in-progress” pictures, I’ll talk you through it as best I can. I started by covering the “roof” with thick plastic sheeting (attached with a staple gun) to keep the rain out. There are Virginia Creeper vines that cover the roof of the gazebo every spring, so you don’t see the plastic at all. The seating was really easy. I measured the space, went to Home Depot and had them cut 3 pieces of 1″ thick particle board to fit (it’s cheap, strong, and practically indestructible). I bought clearance remnants of rain slicker-like outdoor material at Denver Fabrics, and 3″ thick foam for the seats at Joann Fabric (with a 40% off coupon of course). I placed the foam on the particle board, covered it with the outdoor fabric, and used a staple gun to “upholster” the seats and drape the fabric down the front to cover underneath the seats. 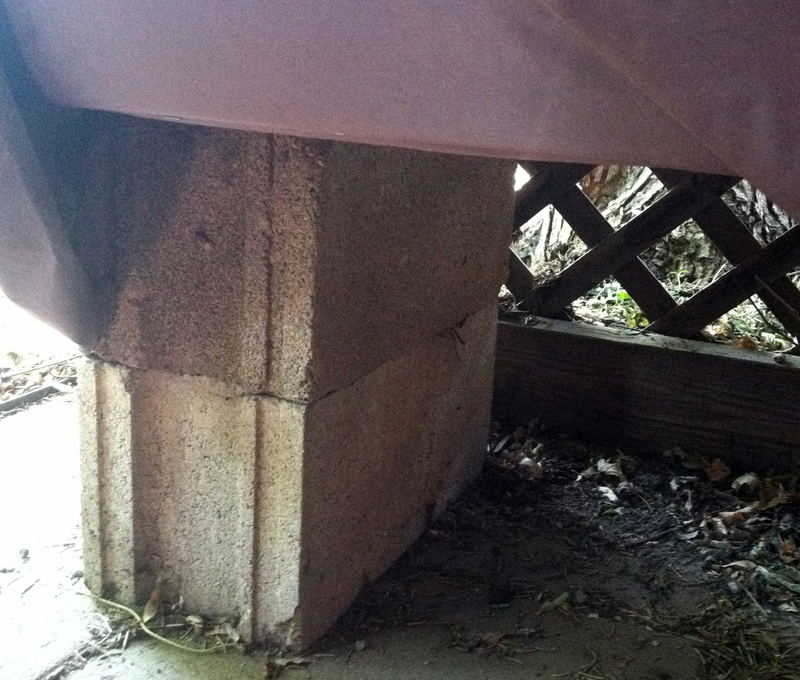 As a base for the seats, I stacked concrete blocks that I got from a neighbor for free. That’s it! It’s held up great for the last 3 years. I may eventually change the fabric if I find something else I like better, but for now this works great. For the Seating, concrete blocks. All the pillows came from the thrift store for $2-4 each, a couple of them I covered with fabric left over from other projects. Because they were cheap, I don’t really care if they get ruined being out in the weather, and I can easily replace them. 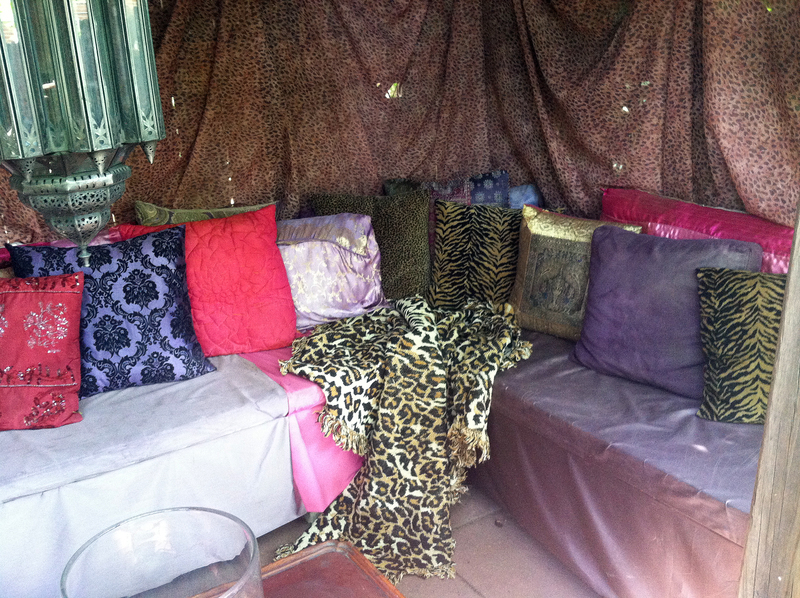 The leopard throw came from a yard sale for $2. 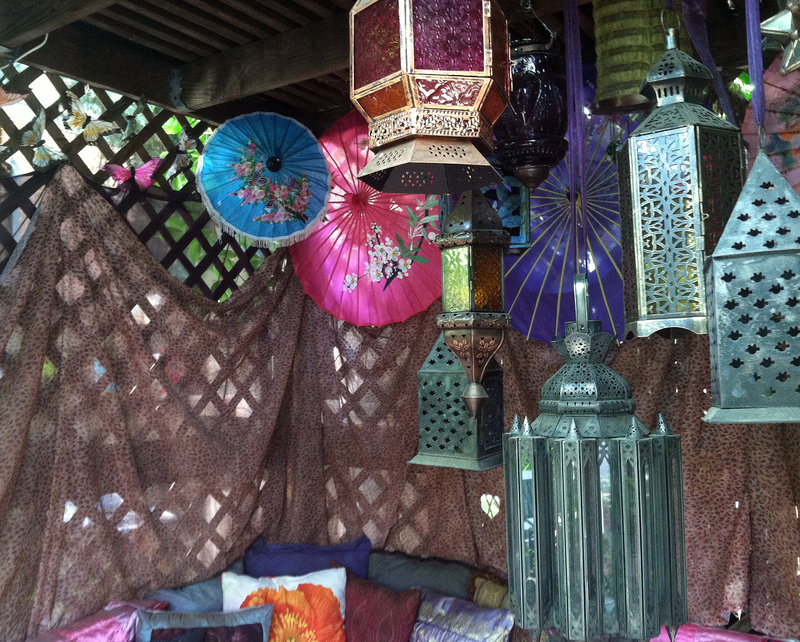 The Asian table in the middle was a $12 Goodwill find, and all the hanging lanterns and umbrellas came from various thrift stores and yard sales. 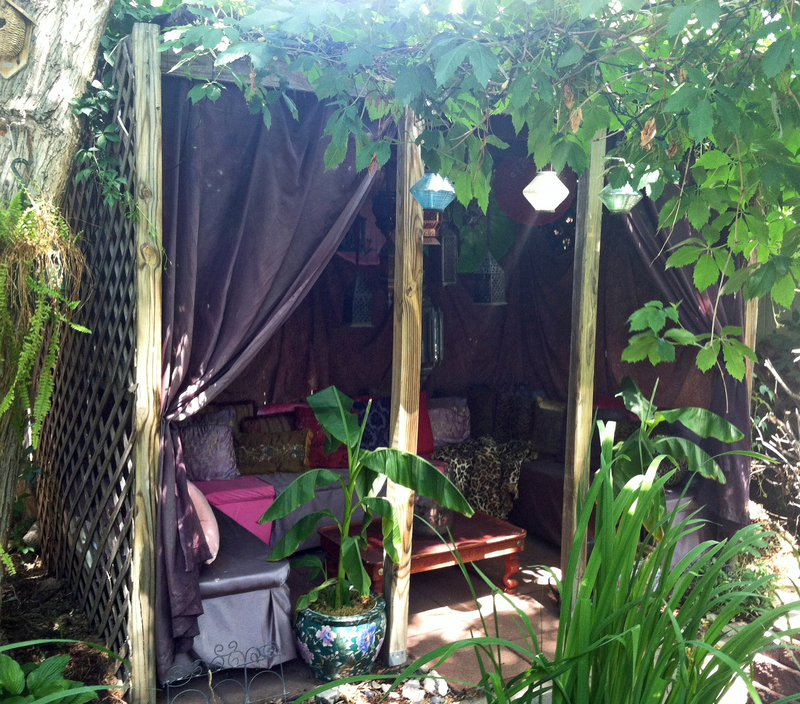 The fabric that is draped around the inside and the purple curtains were from my old art studio, and originally came from Big Lots for just a few dollars. They are all in a nylon fabric that has held up well to the elements. The two big flowered ceramic pots with the banana plants in them also came from Goodwill, about $8 each. For nighttime, I strung up a long string of clear led lights on the ceiling inside the gazebo, and added two short strings behind two of the umbrellas (I may add more lights in the near future) The “fire” you see in the night pictures is from a “Sungel” pot placed in a large heavy glass container I picked up at a yard sale, and I placed little battery led candle lights in the hanging lanterns (I know, the nighttime pics are not so great. I promise to update them as soon as I get a new camera). The whole project cost about $300. 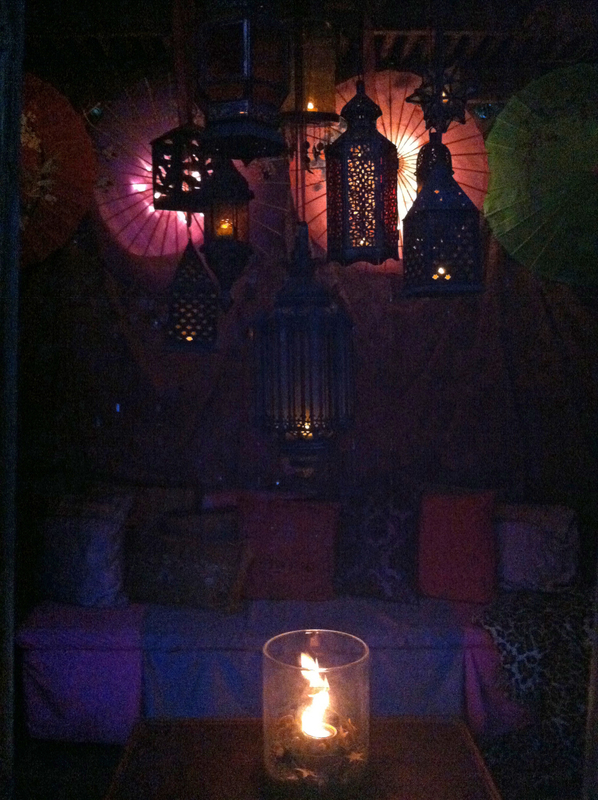 Everyone loves to hang out in the gazebo. 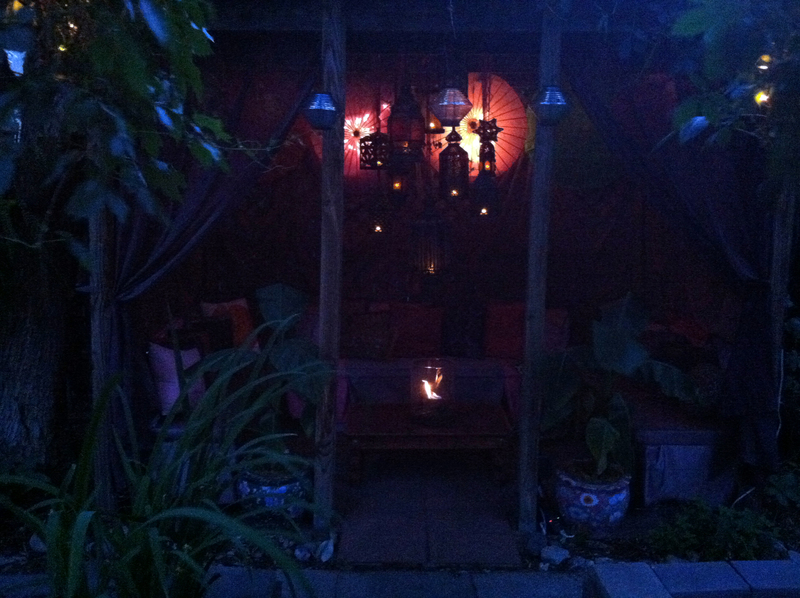 It’s where people tend to gather at parties and after dinners. I love it, too. I often spend quiet afternoons out there reading, working on my laptop, or the occasional nap. (There is a small pond next to the gazebo, the sound of water is very soothing…) It’s my own little piece of the tropics, right here in Denver. 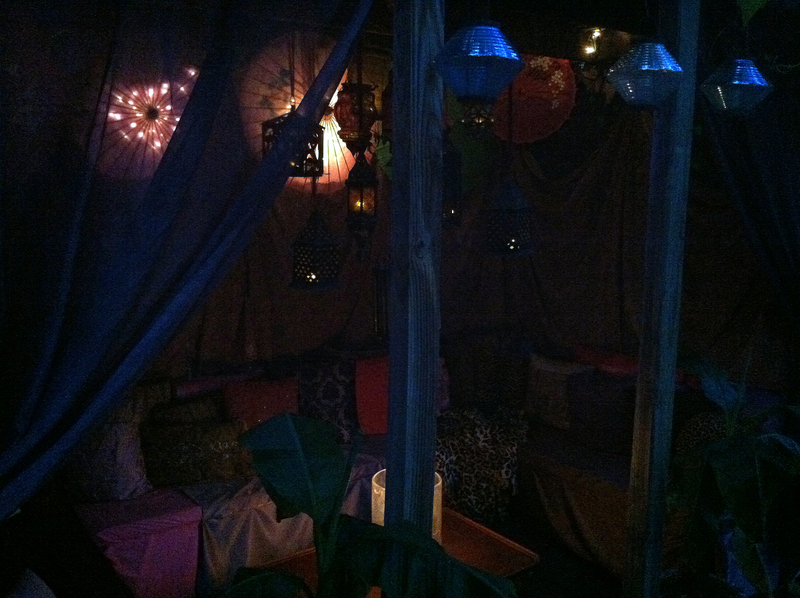 I hope this inspires you to create your own backyard Oasis! I’d love to hear about your backyard projects in the comments section. 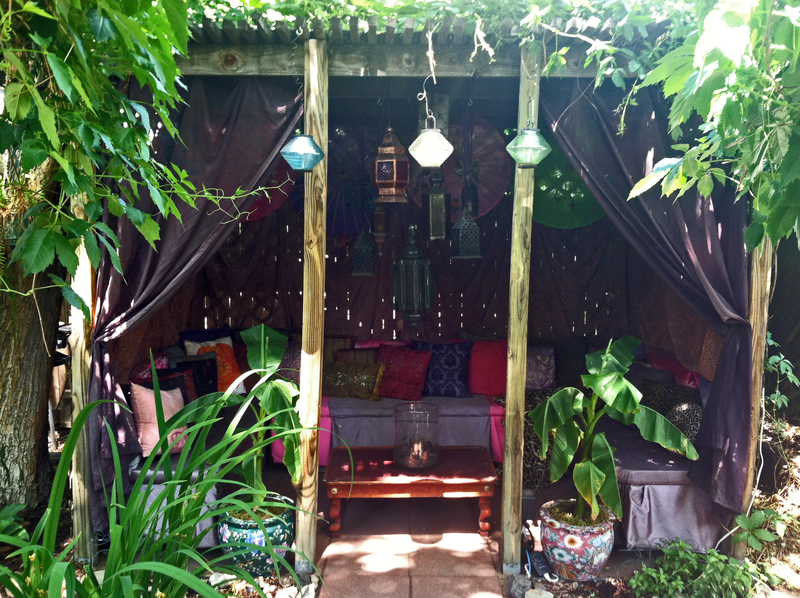 This entry was posted in decorating, DIY, gardening, home, lifestyle and tagged Asian yard, backyard oasis, bargain hunting, best for less, budget, decor, decorating, Denver Fabrics, DIY, diy gazebo, diy outdoor seating, fine living, garden oasis, gazebo, gazebo make-over, Goodwill, Home Depot, joann fabric, lifestyle, Moroccan yard, outdoor decor, outdoor decorating, redecorating, redo, restyle, saving, thrift store, thrift store shopping, thrifting, tropical yard, yard sale. Bookmark the permalink.